Rosemary (Rosemarinus officinalis) is an aromatic, perennial evergreen shrub in the mint family (Labiatae) native to the hills along the Mediterranean, Portugal, and northwestern Spain. 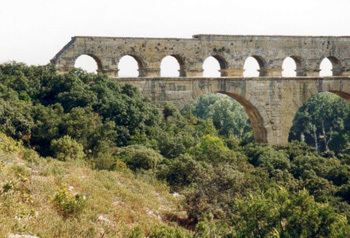 Characteristic habitat of rosemary, southern France near Pont du Gard. There it grows to a tall shrub 4 to 6 feet high. The plant was also brought to Britain with the Roman armies. The name Rosmarinus comes from the Latin ros maris or ‘dew of the sea’, from the dew-like appearance sea spray creates on plants growing close to the water. It was later called Rose of Mary or rosemary in honor of the Virgin Mary. There are various stories or legends to explain this association. The needle-like leaves of rosemary. Even in ancient times rosemary was associated with remembrance, memory, and fidelity. In Roman times students wore springs of rosemary in their hair so that their memories would be better. In Shakespeare’s Hamlet, Ophelia says ‘There’s rosemary, that’s for remembrance, pray you love, remember.’ Rosemary was entwined into the bride’s head wreath to encourage couples to remember their wedding vows. It was added to wine and used to toast the bride’s special wishes. Someone could be made to fall in love merely by being tapped on the finger with a sprig of rosemary. It also became a funeral flower, symbolizing the memories of loved ones. It was used in embalming and was placed in tombs as far back as ancient Egypt. In Australia today, a sprig is worn on Anzac Day in memory of the dead. The plant has a grayish-green appearance. The thick, leathery leaves resemble needles, with a dark green upper surface and powdery white, hairy underside. The small, pale blue, pink, or white flowers grow in clusters of two or three along branches. The small flowers grow in clusters along the branches. Rosemary is used as a landscape plant in mild climates. Rosemary is now widely cultivated outside of Europe. 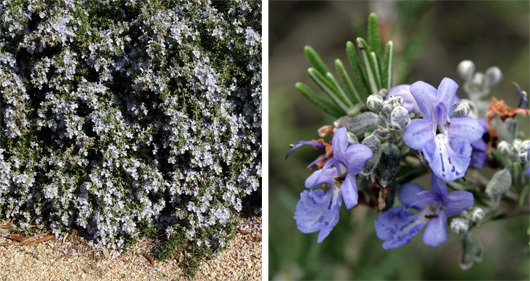 Because it is winter hardy only to about 20°F, rosemary is generally only grown as a potted plant in Wisconsin. Plants do best in bright light (full sun) in well-drained soil. The soil should be kept moist, but good drainage is a necessity. Fertilize lightly as excess fertilizer reduces flowering and fragrance. Good air circulation is important to prevent foliar disease. Potted plants can be moved outside to a sunny location during the summer, but should be brought inside before first frost. There are two opinions on how to keep your rosemary plant outside in the summer. 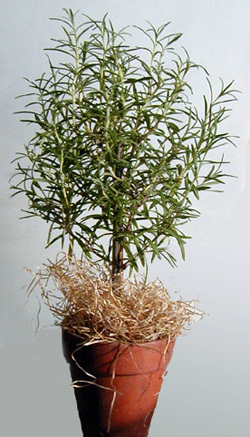 Rosemary shrub in a container. One is to keep the plant in a pot and plant it, pot and all, in the garden with the rim below the soil line. This prevents damaging the roots when you bring it in. But another option is to plant it outside without the pot, digging it up about 2-3 weeks before bringing it inside and put it in the pot until it’s time to bring it inside. Rosemary is often grown as a topiary. Plants can be shaped or growth controlled by frequent tip-pinching when plants are small. Older plants can be pruned lightly to desired size. Allowing a plant to become slightly pot-bound will encourage flowering. Rosemary can be started from seed, but this is not recommended because germination rates are very low (even at an optimum of 60°F for 14-21 days) and it takes up to three years to produce a bush sizable enough for harvesting. In addition, plants grown from seed may not have the same desirable characteristics as selected cultivars. 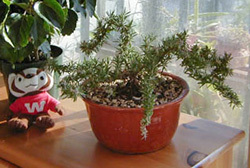 A small trailing rosemary plant growing indoors. Cuttings taken from established plants is the best means of propagation. Take 4-6’ tip cuttings from a ripe, flower-free shoot in late spring to early summer. Remove the lower leaves, then place the cuttings in a sand/loam/leaf mold mixture or a rooting compound such as vermiculite until the roots have formed. Once the root system is established, plant cuttings in pots or outside in a sunny location. To harvest, pick small amounts anytime as needed, but do not remove more than 20% of the growth at a time, and avoid cutting into woody parts unless you are shaping the plant, as this will hinder development of the plant. For drying, cut sprigs or branches before the plant flowers. Hang bundles upside down in an airy place. When dry, you can leave the sprigs whole or strip the leaves from the stem, and store in an airtight container. Rosemary generally has few pest problems, although it can be attacked by aphids, spider mites, mealybugs or scales. Root rot and botrytis are the most common disease problems. The biggest cause of plant decline and death is overwatering. 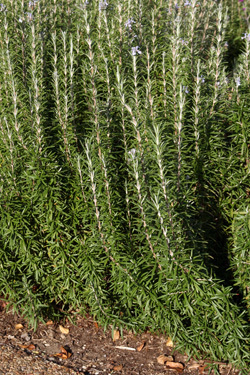 ‘Albus’ or ‘Albiflorus’ (White-flowered rosemary) – Upright, dense growth; white flowers; dynamic bloomer. ‘Arp’ – Upright growth; pungent but without a strong and sharp scent; hardy to 10°F. ‘Collingwood Ingram’ (Wood rosemary) – Upright growth; dark blue flowers; short and plump leaves; looser appearance with gracefully pendulous branches. ‘Creeping’ – Prostrate growth; deep blue flowers; long branches that twist and curl and recurve; blooms almost continuously. 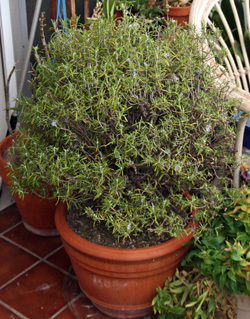 ‘Officinalis’ (Upright Rosemary) – Upright growth; blue- violet flowers. 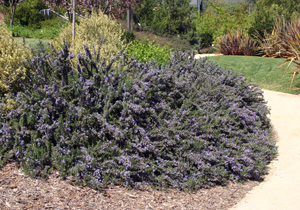 ‘Tuscan Blue’ (Tuscan Blue Rosemary) – Upright growth; deep blue-violet flowers; reddish stems; fast grower; mild fragrance; hardy to 15°F. 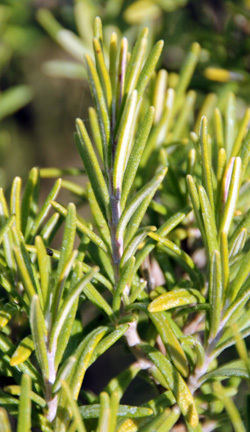 Rosemary, both fresh and dried, has numerous cosmetic, decorative, medicinal, and culinary uses, besides its ornamental appeal. The aromatic oil is added to soaps, creams, lotions, perfumes, and toilet waters. The leaves can be used in sachets and potpourris, as well as in herbal baths, facial steams, hair rinses, and dyes. Rosemary is used as an astringent and cleanser in bath and beauty products. Rosemary water is often called Hungary water since one of the Queens of Hungary was said to bathe in rosemary water everyday, and that she was so beautiful even in old age that she was asked for her hand in marriage at the age of 75. Rosemary is used for many purposes. Long included in herbalists’ stores, rosemary is used as an antiseptic and astringent. Sixteenth century Europeans carried it in pouches and in the heads of walking sticks to ward off the plague, and judges placed it on their benches to protect them from typhoid. Until recently, rosemary purified the air in French hospitals. It has been prescribed for depression, headaches, muscle spasms, pains, sores, eczema, bruises, wounds, and to restore digestion. Studies show rosemary leaves increase circulation, reduce headaches and fight bacterial and fungal infections. It contains many compounds that are reported to prevent the breakdown of acetylcholine in the brain, usually a symptom of Alzheimer’s disease. Japanese researchers find it promising for removing wrinkles. However, prolonged handling of fresh rosemary plants or using cosmetics scented with rosemary oil may cause contact dermatitis in sensitive people. Peel and cut your choice of vegetables into 1’ chunks. Toss in olive oil (flavored with garlic is nice) and chopped rosemary leaves. Bake at 350°F for 45-60 minutes, depending on the quantity until the vegetables are soft. 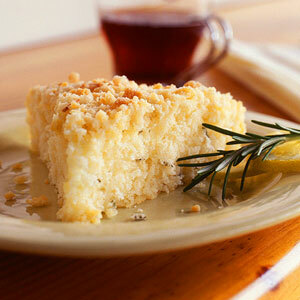 Combine remaining flour mixture, rosemary, baking powder, and baking soda; add buttermilk, lemon juice, and egg. Beat at medium speed of a mixer until blended. Spoon batter into an 8-inch round cake pan coated with cooking spray. Combine reserved 1/2 cup flour mixture, lemon rind, and water; stir with a fork. Sprinkle crumb mixture over batter. Bake at 350&176; for 30 minutes. Cool on a wire rack. Garnish with rosemary sprigs and lemon slices, if desired. Rosemary is best grown in a pot and then placed in the soil below the rim. It has been used for health and beauty and cooking.